Okey dokey, this is not a novel by Snoopy, but it *was* a dark and gloomy day here in the Pacific Northwest today. I posted my sentiments on Facebook and my cousin’s wife shot back: “Come to see us, bring shorts, swimsuit. We have sunblock.” She only lives in Texas. I thought briefly about jumping in my private SST and zipping over to take her up on her offer, but one thing – well, two things – prevented me from doing that. Primarily, today was the date of the Oregon City Antique Fair. Secondarily… I don’t have a private SST, so that wasn’t really a viable option in the first place. Minor details. I had planned on the Antique Fair. In fact, when I got up this morning, I headed down there first thing. There was absolutely no parking and I decided it was simply not meant to be. I came home, told Harvey that I was going to save money and work in the garden and on some Hallowe’en crafts. Then the rains started. Dark and gloomy. I put away all the deck chairs, cleaned up my craft mess (which was outside), and stared out at the darkness and gloominess. Rain. Why, I bet a bunch of parking spaces just opened up at the antique fair! So I put Harvey in his kennel and headed out a second time. I like antique fairs because I get a glimpse into what half my house is worth. Take for example: vintage and collectible medicin bottles and blue Ball jars. At approximately $3/item, I have a considerable fortune in my possession. Vintage spurs – $15/pair with straps. I have 2 pair. Old books, vintage opera glasses, half a hames – wow, the stock in my possession just keeps racking up. Who knew half a hames was worth anything? If you are unfamiliar with what a hames is, it is a horse or mule collar, generally the wood-and-iron part. Then they hit you in the nose with their umbrella as they try to fold it down. They are carrying an umbrella because they didn’t grab a rain jacket when they left home and the umbrella is always in the car. I had a hat and a jacket and I left my umbrella in the car. I saw a lot of over-priced items, pretty glassware, collectible miscellany, watch and clock parts (apparently antique fairs are a great place to sell to the Steampunk crowd), horse tack, and heavy old furniture (nothing of outstanding antique quality). I was hoping to find some old painting frames to display some vintage doilies my husband inherited, but nothing jumped out and tripped me. In the end, I purchased one item for more than it is worth, but for less than the vendor was asking. The vendor wanted $10. I figured it wasn’t worth more than $5. I paid $8 for it and am reasonably happy even though it was not much of a steal and certainly not a real bargain. It remained a dark and gloomy day, I didn’t fly down to Texas to hang out in the swim pool with my cousin’s wife, but I did get to wander around the antique fair. And considering that I spent $8 but I calculated how much money we’re sitting on in terms of junk collectibles, I feel rich. And I think I’m a tad better writer than Snoopy.
. Maybe my grandma had one in her house…..
Oh, shoot, Colleen – I meant to put that in the blog post. It’s a paint-by-number oil. 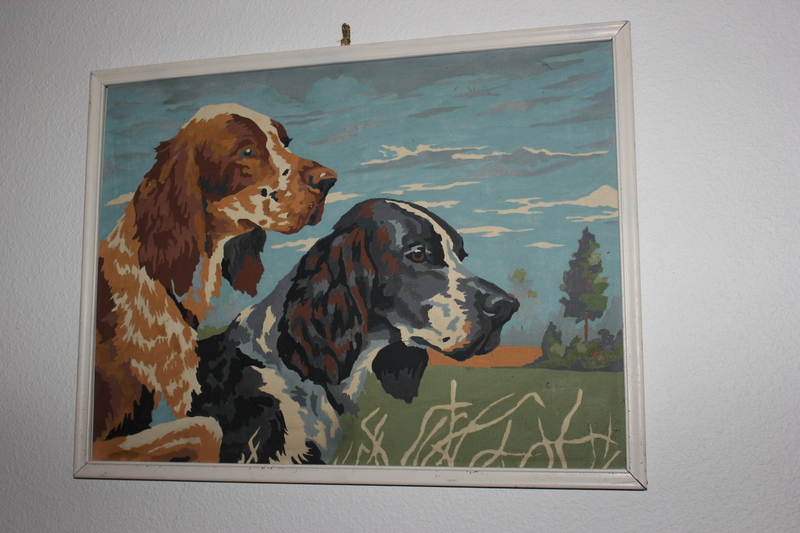 I couldn’t find it when I googled paint by number English Setters, but that is what is is. And maybe your grandma did have it in her house. The grandma I remind you of, I hope? hehehe!